It takes a lot to innovate in the world of computer mice these days. After all, seen one mouse seen them all, right? Wrong. Microsoft has figured out a way to innovate the mouse with their Arc Mouse. 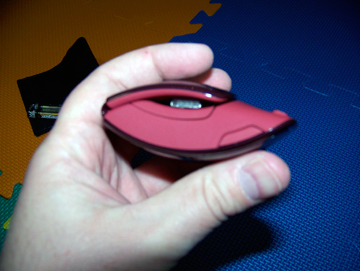 When I first saw the Arc Mouse the first word that popped into my mind was “Cool.” The design of the mouse is something I haven’t seen before, and it just looks cool. As the name implies it is an arc shape, and the underside of the mouse is hollow. 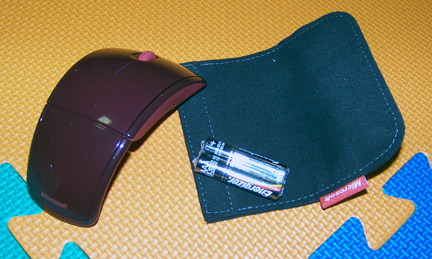 The allows the mouse to be folded up for travel (it comes with a nice travel pouch). The mouse is available in black and red. I got the red one and would call it more of a magenta/brick red color. As an art teacher, it is not something I would call red. As nice as the design it, it does not interfere with function. It is a two button mouse with a scroll wheel/third button. 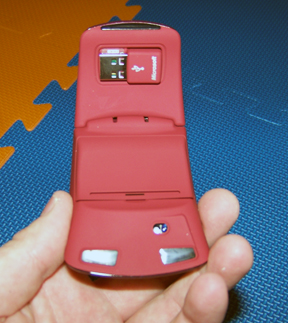 Did I mention this is a wireless optical mouse? Well, it is and the USB receiver is the size of a thumbnail. 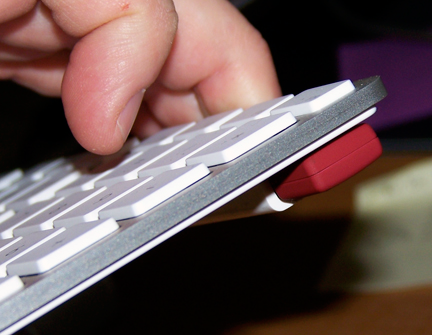 If you have a new Apple keyboard it tucks nicely under the keyboard in one of the USB ports. If you have a laptop it is so small you don’t have to worry about knocking it out or bumping into it when using your laptop. Design plays a factor here to. The receiver stores under the mouse in a little notch. What about using it? The mouse is fantastic. I don’t think I have used a smoother and more responsive mouse. If you use a mouse pad, even though you don’t need one, you might find the design of the mouse causing the end to get stuck if you go off the edge. I like using a mouse pad (I don’t know why) and this kept happening to me. Setup is easy too. You can use Apple’s mouse settings or download drivers specific for the mouse from Microsoft. My one and only complaint is the size of the mouse. I am 6′ 4″, and I don’t have small hands. The mouse is a little on the small side for me to comfortably use. However, my wife is a little over five feet and she has smaller hands. The mouse is the perfect size for her, and she loves it too! Finally, we get to price. The retail price of the mouse is $59.99. I have seen it for under $40 at Amazon. Mice prices are strange. You can get a generic mouse for under $20, or something nicer for more. This is one of those “nicer for more” mice, and I would shop around before buying. Is it worth $40, I say yes. Would I pay $60? I don’t know, but you might. Overall, the Microsoft Arc Mouse is a great mouse in a crowded market. It is definitely worth considering if you are mouse shopping (the computer kind, not the pet).